The Irish Times' Unthinkable column was born out of frustration. In the wake of the 2008 financial collapse, the loss of Ireland's economic sovereignty and allied social and political upheaval, there was a momentary sense of change - and change for the better. A new kind of capitalism was in the offing. Politicians promised to wrest power from the markets and put people in charge. But no sooner could you say "Occupy Wall Street" than it was back to business as usual. A transformative opportunity to create a fairer and more just society was lost, and part of that seemed to be because of a failure of imagination. Albert Einstein said, "We cannot solve our problems with the same thinking we used to create them." Yet time and again human beings emerging from traumatic events return to the same type of reasoning that got them into trouble in the first place: Focus on the short term; if I'm ok everyone is ok; trust the experts. 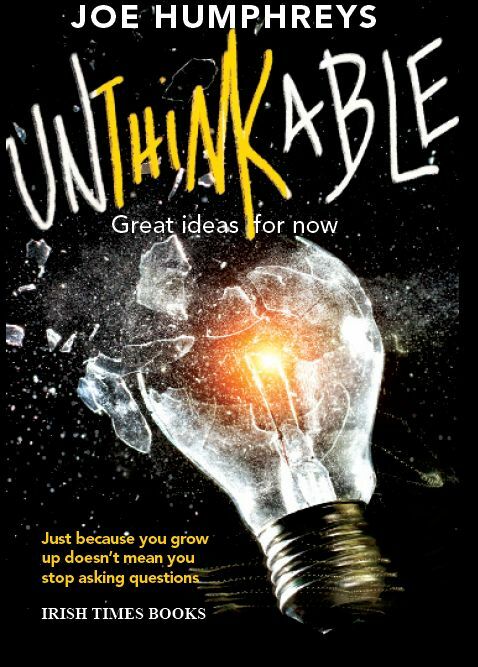 Unthinkable was born on World Philosophy Day 2013 as a small gesture towards imagining a different future. The plan was that different thinkers would be asked to supply one great idea, either of their own or borrowed from another. The aim? To show that alternatives are possible, not just in politics and economics but in the cultural realm and in our attitude towards human values. If there is one underlying theme of this book it is that our values require constant reassessment. 1 recall my philosophy lecturer at University College Dublin, Fr Fergal O'Connor, saying that when you grow up you become "principled", by which he meant you stop thinking for yourself. Part of maturation is that you become fixed in your views. Reviewing your moral outlook is troublesome. Changing it is painful, typically requiring a blow to your pride. "The paradox that I have found time and again is that for a tiny investment of material goods—perhaps 2 per cent to 3 per cent per year of our global income—we could mobilize our technological excellence to end the scourges of extreme poverty, disease and environmental degradation that cause great global suffering and that in fact threaten our very survival. Solutions to our global material problems, whether climate change or epidemic control, are within our grasp, but only if we try. We face, therefore, a moral crisis, not a material crisis. We face a problem not of means but of ends. As Aristotle might have said, we have the techne (the technological know-how) but not yet the phronesis (the moral wisdom) to choose survival over death." If that seems melodramatic consider this: 1.5 million children under the age of five die from vaccine-preventable diseases each year. Individually and collectively, we could choose survival over death for those children. We have the technology. What's absent is an acceptance that we have a responsibility to do something. This book features 70 ideas, divided under category headings, ranging from Ethics to Education. Such lines of demarcation, however, should not be taken too seriously. One of the great mistakes of modern life is to drive a wedge between different areas of inquiry: to divorce science from spirituality, for instance, or economics from morality. In a complex world, it is tempting to reduce knowledge to isolated chunks of technical expertise. One might well call that knowledge but it's not wisdom. A barrier to independent thinking in this or any age is an inner voice of practicality. People instinctively resist ideas that involve change. When something radical is proposed reasons immediately surface as to why it can't be done. Reformers are told to be "realistic" but as the Brazilian philosopher Roberto Unger points out "a proposal is realistic to the extent that it approaches what already exists". In Unger's view, we have come to accept a "closed list" of possibilities; any ideas outside of this are dismissed as either Utopian or trivial. "What is the central problem in contemporary social thought?" he asks. "The central problem is the breaking of the vital link between insight into the actual, and imagination... of the adjacent possible." My father had been a great believer in the "adjacent possible". An engineer and businessman, he liked to invent things, among them "an ultra-low cost, multi-purpose third world vehicle" which, alas, never got off the drawing board. In the last decade of his life, he developed a job-creation concept, tackling what he saw as the inefficient use of global wealth. The idea was that "owners of surplus wealth" would be incentivised to invest in job-creation rather than unproductive activities like property or bank shares. These owners - the phrase "the 1 per cent" hadn't been coined by then but that's roughly who he had in mind - would have to pay a wealth tax unless they could demonstrate their money was delivering a certain return in employment worldwide. My father's concern was more than academic. He was made redundant in a company restructuring, and while he found work again he never forgot how demoralising it was to be unemployed. Before he died in February 2008, he approached several people including a prominent economist with this idea of a global wealth tax that would be linked to "job-rich investment". He got nowhere with it, and I dare say 1 was among those who dismissed his idea as impractical. But, as time has passed, I've had to revise that opinion. In early 2013, Eurozone finance ministers agreed in principle to a "Robin Hood Tax", a small levy on financial transactions. Moreover, governments worldwide are starting to collaborate on taxation policy in an unprecedented manner because of concern over tax avoidance by multinationals such as Starbucks and Amazon. Posthumously, then, I'm adding - as a 71st idea - my father's proposal that "the owners of surplus wealth will be expected by governments worldwide to take responsibility for maintaining an acceptable level of employment on a world-wide basis". Because sometimes the craziest ideas are the best.